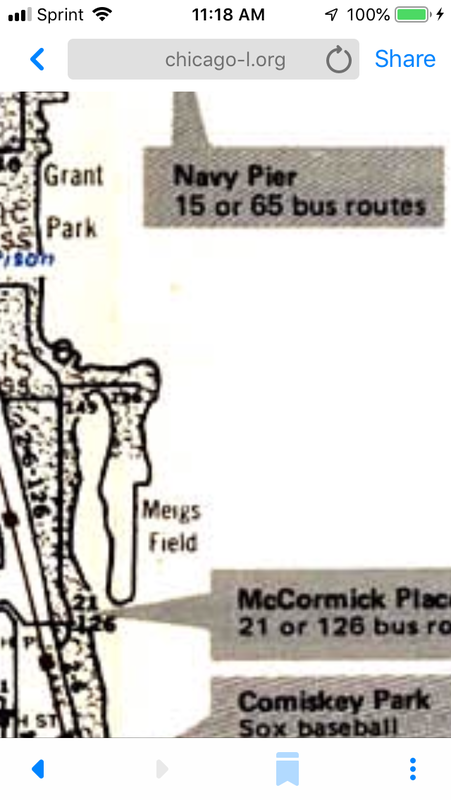 Why doesn’t the #74 Fullerton Bus operate east of Lincoln Avenue to connect with Clark Street, Lake Shore Drive corridor bus service, or Lincoln Park? –D.J. Good question. I’ve often wondered myself why the #74 isn’t an option for getting from neighborhoods like Belmont-Cragin, Hermosa, and Logan Square to the Lakefront Trail and beaches. As it stands, the Fullerton bus starts at Nordica Avenue (7000 W.), heads east to Halsted Street (800 W.), south to Webster Avenue (2200 N.), east to Lincoln at Larrabee Street (600 W.), and then northwest on Lincoln to Halsted again before returning west. That means it never takes you within a mile walk of the lake. “Service planning is a complex process,” Ferradaz added. “When analyzing service, among the myriad elements that factor into any decision made, CTA planners must look at the route in its entirety, not just the area where a modification would occur. They must also look at any potential impacts a route modification could have other routes serving the area. She’s got a point about congestion. East of Halsted, Fullerton becomes a picturesque-but-narrow two-lane street where traffic jams are the norm. There’s so little extra room on the road that I don’t even like biking down this stretch, so it’s no wonder that the CTA doesn’t want to run buses down it. Eventually, branch lines were built to Madison from both Milwaukee and Chicago, he said. Madison had a daily passenger train to and from Chicago at the tail end of private operation, just before Amtrak was created. Madison was not included on the Milwaukee Road’s mainline between Chicago and the Twin Cities so it was left of the map. “Routes that were not included are impossibly hard to get back now because of railroad opposition, money, and/or politics,” the railroad man said. However, he ended with a note of optimism that there may once again be rail service to Madison. With a new Democratic governor [Tony Evers] in office, there’s new interest in this on the part of the state. Correct. Construction cost per lane-mile will obviously be higher for superhighways than section-line roads. Maintenance costs should be fairly similar. You may be interested in this lengthier examination of the subsidy question, done by consultant Tom Rubin. You are contradicting yourself: you stated that lane miles are similar across the various systems and now say that lane mile cost for superhighways ‘will be obviously higher’. Man, this is why it’s so frustrating: everyone has an angle and finding actual information is therefore such a challenge. I mean, you just gave me a ‘for more information’ link to an organization comparable to climate change deniers. I honestly don’t have a dog in this fight and the source I have placed trust in you dismiss out of hand and counter with ‘The American Dream Coalition’. Ugh. Sorry; I thought you would look at Rubin’s analysis and supporting data rather than dismissing it based on what website is hosting a copy of his paper. All the data he’s analyzing comes from BTS reports that he cites. I think it’s accurate to say that maintenance costs per lane-mile are similar on different types of roadway, but construction costs will differ substantially. Superhighways are now built with much deeper bases and pavement layers (in part so they need less maintenance later). I don’t mean to diminish your work, I love old maps. But I have seen official city documents (not CTA) over the years that were simply incomplete when it got to our area, or were obsolete shortly after being made. We’ve had people from city departments contact us in the past to ask for various maps showing sewer connections, etc., being built in the lake makes this is a very unusual part of the city, to say the least. I’ve got a good friend who has lived in the area his entire life, I’ll see what he remembers, maybe the mothballs here are getting to me. OK – so he can’t remember as far back as the time period I was referring to, but he confirms that the 12 Roosevelt was turning around at Indiana in the late 80s, the bus that serviced the museums came via Balbo, he remembers that being the 146, but it might also have been the 126, another fella who has worked here for 45 years told me the 126 served the Museum Campus for a while, so yes, I’ll say I’m wrong and have confused that with the 12 Roosevelt, mea culpa. I’ll readily admit that perhaps I didn’t understand my colleague here or he didn’t understand my question. What I remember is a bus to Adler, a few of us went there for an after school program from the North Side, so I know we took the train downtown and then transferred, it’s definitely possible I’m mixing up the Roosevelt stop i used in high school (85-89) with a different stop in that time period (call it some time during 83 – 85). So you get my apology for being wrong on the 12. I’m actually just happy I’m not completely insane. I can certainly see how I confused the 126 for the 12, especially given that the 12 did come to the lake for a while. But bigger picture, you’re still not understanding my actual point, which is not what the buses did 30+ years ago, but rather that service to the Museum Campus is insufficient for those of us that rely on it right now, and its getting worse. Just since the Museum Campus rebuild, bus service has diminished / gotten more erratic considerably for everyone except those summer tourists, who get the 130, but which does not run during the morning rush hour. Only every other 146 now comes here, and the 12 Roosevelt does not. And let me repeat – the 12 most definitely did come here, and cutting that service was a poor decision, and disproportionately impacted West Siders. We’re all open 12 months a year. Thousands of people work here. We now have tens of thousands of people actually living due west of us in the still developing South Loop. It can take the bus literally 10-15 minutes to get from the Field stop to Roosevelt L station. All of these things are happening, right now. I’d argue that if we want to be a true cosmopolitan city like our peers, we would absolutely run a subway extension extending to the campus, because even if they add more buses, bring back the 12 (or apparently 126), a bus has to cross Columbus and LSD (or go all the way south to 18th), so the service is going to be dodgy. Did the CTA Set up the Lincoln and 31st Street Bus Reboots to Fail?